Just a quick update today, as we're getting ready to leave for my appearances at the Kansas City Renaissance Festival! The big news today is that we're running our annual HALLOWEEN SALE today & tomorrow! (Sale ends at midnight late Friday night). 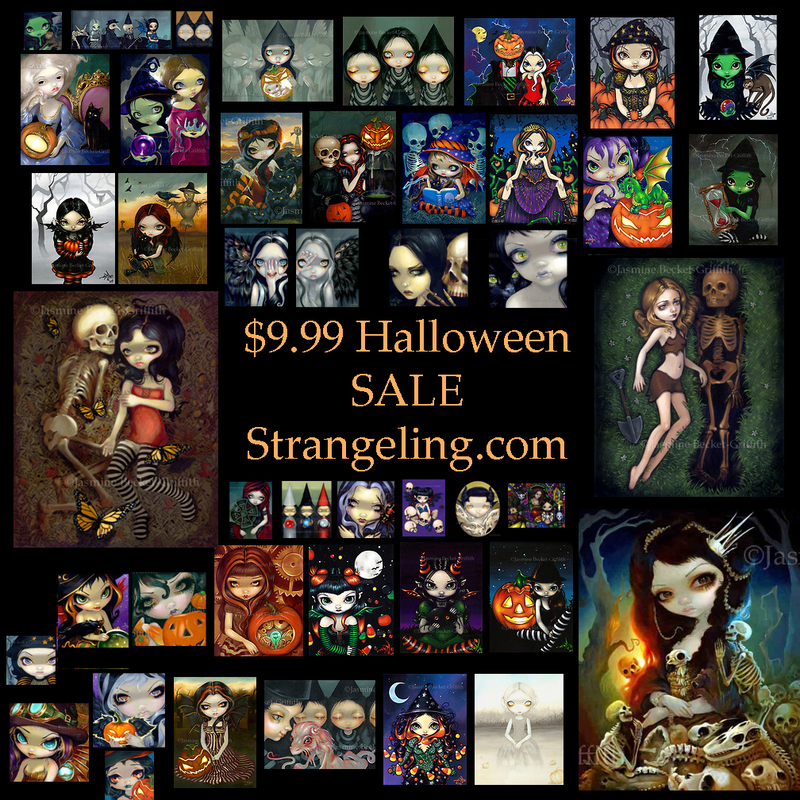 At Strangeling.com our entire Halloween section HERE is on sale - details below. And yes indeed - the Kansas City Renaissance Festival has opened for the season! I will be there in person this weekend September 27 & 28, and I will be there in person next weekend October 4 & 5, Click HERE for details about the show! My shop there is called Strangeling: The Art of Jasmine Becket-Griffith - it is #251 - right down the path from the Joust. Anybody who comes to my shop this weekend wearing Fairy Wings will get a FREE MINI PRINT! More details about the event are HERE. All 8x10 Halloween Prints $9.99 HERE Thursday & Friday! All day today & tomorrow (until midnight late Friday night) is our HALLOWEEN SALE - over one hundred Halloween themed prints all $9.99 - all signed by me on the back -for 8x10s, $19.99 for 12x16s. WORLDWIDE SHIPPING. Only at Strangeling.com - sale ends MIDNIGHT Friday night! The sale prices are active and already marked down. Just select your size under Fine Art Prints on each image by clicking on the Choose an Option dropdown box. No limit, order as many as you like - mix & match! Plenty of time to get them to decorate your home for Halloween (or if you're like me, just decorate your house like it's Halloween any time of the year). I've finally had time to create some new ACEO Cards! You can see them all here . I only make ONE card for each painting - they are trading card sized - 2.5"x3.5" canvas giclees I have hand embellished in acrylic paints, signed, and since only one of each is ever made I have numbered them #1 of 1. Bidding as always starts at just a penny! Perfect for those of us without much wall space or who want to start a collection and are on a budget. These fit in perfectly to the plastic sheet holders used for baseball/Pokemon cards for binders, or you put them into ACEO frames. You can browse through them all here - the auctions end the evening of Tuesday, September 30th. Enjoy! My annual December solo show this year is very special - "Miniature Marvels"! This is specifically a "small format" show with all pieces of artwork 8x10" or less in size. A never-before-seen collection of small new originals, new original miniature paintings, new original Tiny Treasures, and introducing our new open edition mini canvas prints - just in time for Christmas it will be the perfect time to pick out a gift for yourself or for the Jasmine fan in your life! Stay tuned for more details, works-in-progress, and sneak previews. I will be working on these special little beauties over the next three months (especially when I'm on the road with my travel easel!). Pop Gallery Orlando is Jasmine Becket-Griffith's flagship gallery - the widest selection in the world of Jasmine's artwork, original paintings, books, prints & merchandise. Collectors of Jasmine's original paintings at this event will find framed originals from 8x10 and smaller. 8x10" sized framed original paintings are typically priced $2000-$3000, Framed Mini Paintings (around 2.5x3.5") are typically priced at $395, Tiny Treasures (3" square wooden blocks) are typically $195. 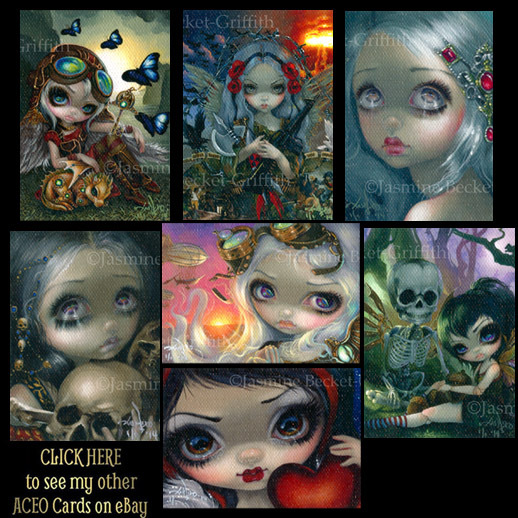 The new open edition mini canvas prints (which Jasmine will be happy to sign or dedicate to you in person!) will be priced at around $30, and mini prints of various paintings will be priced at only $3.00 each. Something for every budget, every collector, and perfect stocking stuffers! or call them at 407-827-8200 and let them know you'd like to be contacted when new Jasmine paintings are available! for you CALIFORNIA FOLKS - don't forget - I'll be at Disneyland's WonderGround Gallery at Downtown Disney in Anaheim California the week prior -to debut new Disney artworks - October 11th - details about the Disneyland, California event areHERE.